while i create private key in Mendelson, there are 2 options saying 1. Encryption and signature, 2. 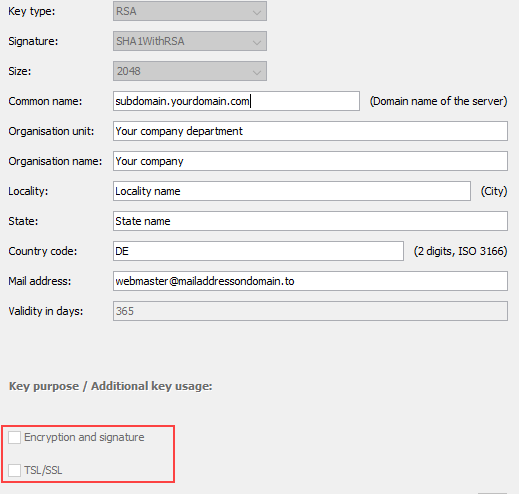 TSL/SSL, who knows what's functional use of these 2 options? After I extract the public key from this private key, and send it to partner for installing in receiver sever, what's the impact for the AS2 communication? just generate keys some keys with and without the options, then you will see that there are set some key extensions which may (or may not) required by your partner for TLS/SSL keys or encryption/signature keys. Please remember that this is just suitable for self signed keys as the CAs trusting process will overwrite these attributes (It is part of the CAs business model to sell keys for different purposes using different prices where they are technical the same but have different extensions). Thank you for your answer, i will create the key with both option and to see what exactly the extension is?